Writing prompt: Think about the relationship between Sara and her father in the novel. Write about a relationship between you and someone else in your family. Have the students write an alternate ending to Serendipity & Me. Have your students write a persuasive letter to their parents about why they need a certain pet. Serendipity’s and Sara’s naming are explained in the novel. Your students could research to find out what their own names mean. Some may be able to find out from parents or guardians how they came to be named. Use the different writing forms in the novel as examples of free verse, prose and structured poetry (the sonnet). Talk about how you read verse differently than prose. Ask what effect the line breaks have on a sentence as regards to meaning and emphasis. This is a fitting novel to use during April (poetry month). Have students find examples in the novel of figurative language in Serendipity & Me. Click here for a quick reference. You might want to use media clips from Cats to show a poem made into a musical. You could use a clip from Peter Pan to introduce the play that Sara’s class put on. Have students write a concrete poem in the shape of their pet (real or imagined). Have the students locate Ensenada on a map of Mexico. How far is it from their own town? How is the climate different from their own? What is the difference in population? What is the average salary inEnsenada compared to the average salary in their own town? 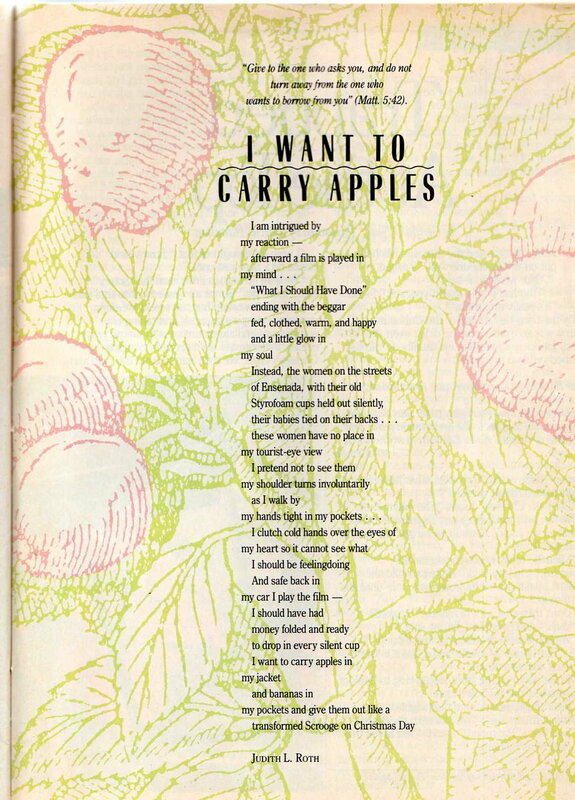 Use “I Want to Carry Apples” to illustrate some elements of poetry. Why do you think the poet chose to put the words in the form she did? What word is pulled to the left? Why? Do you see a made-up word in the poem? Why do poets sometimes make up words? How do you feel about there being less punctuation in this poem than in prose? Julia’s Words is written in a journal format. What are some other ways a story can be presented rather than told as a straight story? Write a story using one of these ways. Not all languages use articles in the same way as English. For example, in Spanish and French, the articles are usually either masculine or feminine, not neutral. In American Sign Language, articles are not used. There are other differences as well. The line “The ranger wanted us to hear an owl call” might be signed “ranger want us hear owl call” or “owl call—ranger want us hear.” Display the night hike page. Have students point out the articles. Where on this page were possessive pronouns left out that might usually have been there? Why do you think they were left out? The first page is not written in journal form. What do you call this kind of writing that takes place before the main story? What is the purpose of a prologue? What are some books you’ve read that have a prologue? What is the name of the opposite of a prologue? What kind of information does an epilogue (or afterword) usually contain? Is there an epilogue at the end of this book? What form does it take? Using the twelve signs delineated at the back of the book, work with the students on making the motions of these signs correctly. Make a list some other signs the students would like to learn. You or the students can look these words up at www.aslpro.com and share them with each other. Finger spelling (the alphabet) is fun for kids to learn and good for dexterity. There are posters you can buy to display. Or find a printable sign language alphabet online. You can enlarge each hand and put it up on the wall or make individual print outs for the students who are interested. Students can use their finger spelling skills during regular spelling learning times to reinforce their knowledge of the spelling of words. Imagine the dragons as people who are not having a good day. What did the child in Goodnight, Dragons do to tame his dragons? What are some things students can do so that others become more pleasant to be around? What qualities did the child in the book display? How can a student show kindness and gentleness? For those classrooms that incorporate naptime, this is a natural book to read aloud before a nap. Download a story time kit with a coloring page, craft activity, game and songs here.